As you read though this, think of how many of the charges laid against King George could be applied to our own government today. I can think of more than one. It is astonishing how many things that we presently consider normal acts of government that the men who wrote this Declaration would have considered acts of unbearable tyranny. 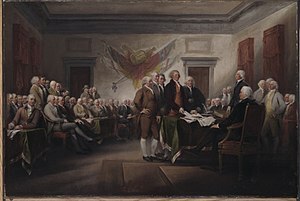 King George was a conscientious and competent leader next to King Barack. I wonder what would happen to a contemporary Thomas Jefferson who drafted a document like this today. Most likely, the Department of Homeland Security would label him a potential domestic terrorist. The mainstream media would excoriate him as an extreme, rightwing, teabagger and probably a racist too. The NSA would monitor his e-mails and the IRS would consider auditing him. Maybe we need a Thomas Jefferson today. And so it has been, for the last 237 years. May God bless America and grant us many more years of freedom.